Rockland County, virtual steps across the Bear Mountain Bridge and south of us, last week declared a state of emergency for measles – and authorities banned unvaccinated minors from all public places to try to stop the spread of the disease. How could we even get to this point? Where are the adults in the room? One hundred and fifty-plus cases so far. This is a disease that can be deadly. The emergency is a serious and important step. And, it’s surely an indication that things are already on the edge of out-of-control in that county. I realize that I have written about this topic before. But things keep getting worse. The research that linked autism to vaccines is bogus – it was proven to be bogus – and it had been funded by lawyers in 1998 who had been engaged by parents to sue vaccineproducing companies. It was a scientific fraud, designed to enable a legal shakedown, that reverberates today. Including in nearby Rockland and Orange Counties, among other places. It has endangered public health in a grave way. I am so concerned about this that I invited Dr. Michael Nesheiwat, Putnam’s health commissioner, to brief us further, and his Perspective is on this page. Of course, the adults who do not vaccinate their children today, by and large, did not have to worry about getting measles themselves. Their parents still had common sense, you see, and had them vaccinated. There are no two sides here. Don’t mess around. Get your kids vaccinated. If you are vacillating, talk to your pediatrician. Please. Now. So he would have been puzzled by the Putnam County Legislature taking up the topic of abortion. It’s a divisive issue (my home state of Minnesota was one of the first states where the internal fight over this occurred among Republicans; an early sign, if you will, of the shift from concern over a strong defense and controlling spending to tinkering with social issues). But abortion is not something that our county can especially change or affect. More than that, it does not lead to a single road being fixed. In business now (unlike when I signed only the back of the check), we constantly have to think of “opportunity cost.” If we take on one thing, we won’t have time for something else perhaps more important. If we spend our income on this tool or software or personnel, what choices will that entail? What do we have to give up or forego? What will that mean for the future of our company? Alas, government is not good at making choices, any choices – not on abortion, or immigration or a host of other things. It is a weakness of government, but perhaps it should also be a cautionary note. We have let the perfect become the enemy of the good. And yes, not a single road was fixed during this debate. Not. A. Single. One. I am grateful for spring, and family. Our two older children had birthdays last week, and we were able to spend a Sunday lunch together, our three kids, two spouses, my wife and I. Time is so fleeting. Embrace family. People occasionally write notes to us when they renew, and I read every one. Some people even renew a couple of years at a time, and I appreciate that, too. From the recent files: Thank you for the Courier. I try to read it cover to cover each week. I’ve lived in Putnam County (my husband also) for nearly 80 years. We’ve seen a lot of changes. A lot of changes indeed. And that, my friends, is surely the understatement of the week. 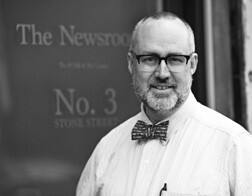 Douglas Cunningham is editor of the Putnam County Courier and the Putnam County News & Recorder. Reach him at 845-265-2468 or at editor@pcnr.com.